Even though I didn't make it to the moon, my machines did. 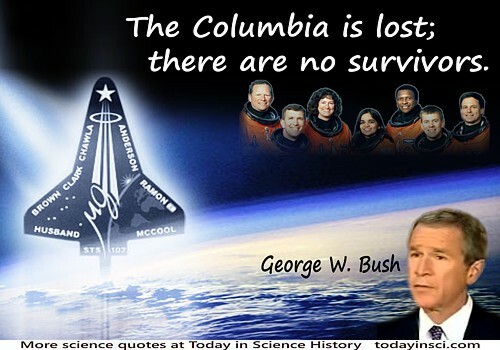 As quoted in Myrna Oliver, 'Obituary: Albert Hibbs, 78; JPL Scientist, Voice of Unmanned Missions', Los Angeles Times (27 Feb 2003) repeating the statement previously published in 2001. Hibbs referred to the Ranger and Surveyor spacecrafts for which he was a systems designer. 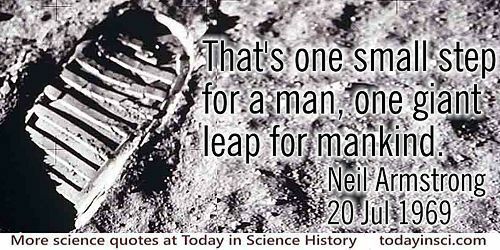 He had passed physical and psychological testing as a candidate to be an astronaut, but the Apollo moon-landing program was canceled before he was placed for a flight. Here men from the planet Earth first set foot upon the Moon July 1969, A.D. We came in peace for all mankind. Plaque left on the moon, 20 Jul 1969. 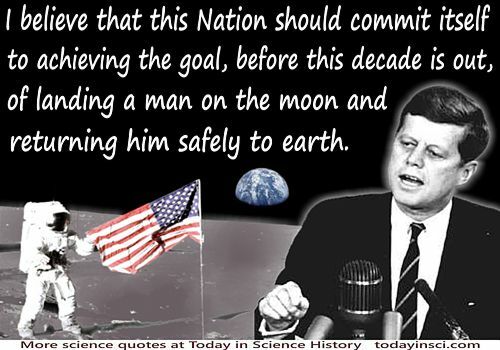 I believe that this Nation should commit itself to achieving the goal, before this decade is out, of landing a man on the moon and returning him safely to earth. Address to Joint Session of Congress, on Urgent National Needs (25 May 1961). On web site of John F. Kennedy Presidential Library and Museum. Also in Vital Speeches of the Day (15 Jun 1961), Vol. 27, No. 17, 518-9. I had no books as a child. I had real machines, and I went out to work in the fields. I was driving farm machinery at five, and fixing it at age seven or eight. It’s no accident that I worked on Hubble 50 to 60 years later. My books were nature; it was very important to how I related to the Earth, and the Earth from space. No doubt when I go into space, I go back into the cool soil of Earth. I’m always thinking of it. Nature was my book. Other people come from that tradition - Emerson, Thoreau, and especially Whitman. Look at what they said in their philosophy - go out and have a direct relationship with nature. When asked by Discover magazine what books helped inspire his passion as an astronaut. 'The 1998 Discover Science Gift Guide: Fantastic Voyages Children's Books That Mattered', Discover (Dec 1998). Address to US Congress, 1975. Science and Technology Committee, United States Congress, House, Future Space Programs, 1975, Hearings Before the Subcommittee on Space Science and Applications (1975), 206. Also in Arthur C. ClarkeThe View from Serendip (1977), 238. So much goes into doing a transplant operation. All the way from preparing the patient, to procuring the donor. It's like being an astronaut. The astronaut gets all the credit, he gets the trip to the moon, but he had nothing to do with the creation of the rocket, or navigating the ship. He's the privileged one who gets to drive to the moon. I feel that way in some of these more difficult operations, like the heart transplant. We wanted to fly. We also had such big egos that we felt that we could fly the crates they shipped these things in. We honestly felt that, with things that were wrong, we always had a mental workaround on them. Rejecting concern about Apollo spacecraft safety. From interview with Ron Stone (24 May 1999) for NASA Johnson Space Center Oral History Project. Which is an astronaut’s favorite key on a computer keyboard? Origin uncertain, but in circulation at least as early as by Chris Salemka, in 'Think & Grin', Boy’s Life (Mar 1995), 61.